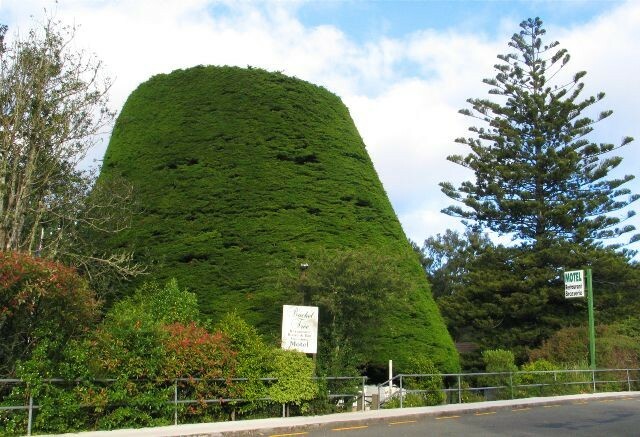 The Borough of Tawa takes its name from the native Tawa tree (Beilschmiedia tawa) which once covered the area. The name Tawa Flat was first used in 1854 in the Wellington Provincial Gazette. In the 1941 Local Body elections, Tawa Flat was part of Makara County, which also included Porirua and Titahi Bay. In 1953 Tawa Flat and Linden became an independent borough. After rapid housing expansion in the 1950s outside the Tawa Flat area, the name was changed (on Feb 23, 1959) to the Borough of Tawa. The Tawa Borough Council negotiated for its own water and sewage system to accommodate its expansion into Redwood and Linden. On the 3 October 1988 the Local Government Commission indicated the Borough of Tawa would be amalgamated with Wellington City. Built in 1944 as a women's borstal, Arohata was the first purpose built women's prison in New Zealand & replaced the Women's Reformatory at Point Halswell. In 1981 it changed functions to become a youth prison, and later a women's prison again, which contained the national female facility for drug rehabilitation. Between April 1992 and May 1994, 40 minimum-security male inmates were also kept at Arohata. In te reo Māori, Arohata means "the bridge". The name was chosen in the hope that Arohata would provide a bridge between past offending, and a future life in the community. Cupressus macrocarpa / Macrocarpa "The Bucket Tree" - registered as a notable tree ("Earps Bucket tree"), it is well over a hundred years old. Its shape was probably originally pruned by young immigrant Frederick Westbury in the 1880s, who worked for the land owner, William Earp. A hockey and cricket sports ground, with clubrooms. The pavilion is also used by the Tawa Wrestling club. was born on 30 April 1856. The first significant post-1840 activity in the Tawa area was the construction of the Old Porirua Road. Cleared and built during the 1840s and supported by stockades (Middleton's, Leigh's and Elliott's), it linked Wellington and the small settlements of Porirua and Paremata on the Porirua Harbour. The road eventually evolved into the old Centennial Highway (State Highway 1). The Old Porirua Road can be traced through Tawa along some streets (Middleton Road, Willowbank Road, Boscobel Lane, Main Road, Oxford Street, Grasslees Reserve, Main Road again, Duncan Park, across Linden Avenue to Linden West Park and back to the Main Road). Redwood Bush, Achillies Close, Tawa. Redwood Bush is a relatively large native forest remnant, containing a variety of plant species. A group known as Friends of Tawa Bush Reserves Inc., lobbies Wellington City Council on issues regarding reserve land in the area. The group has just completed a walking track from Achilles Close to the Brasenose Track, which passes old trees and crosses streams. Tawa College Musical Festival every 2 years on 17 Sept, at the Michael Fowler Centre. The first library in Tawa was opened in August 1964 and was built by volunteer labour. The current library was opened on the Main Road in October 1974. This Library was named after Tawa Mayor Mervyn Kemp. The building was renovated and expanded in 2002. The Tawa Schools and Community Music Festival takes place once every two years, and the last one was in 2004. It involves most of the children in years 5-6 (9-11 year olds) at Tawa's six primary schools, those in the Madrigal Choir at Tawa Intermediate, plus singers from Tawa College. Add to that 100 or so adults of the massed choir, a total of approximately 900 voices all singing in unison. The Society was established in 2003. This fledging group will identify historic sites in Tawa, and make submissions to Wellington Council on creating signage for a heritage trail. The 5.5 hectares Willowbank Scenic Reserve. This area was created by Project Employment Programme workers, who cleared the area. Tawa Rotary club has done much to provide excellent amenities such as barbeques, seats and tables, a war memorial, and a bridge. There is sufficient grassed land for games which make the area eminently suitable for family or group picnics." RSA Memorial Plaque is on the eastern side of the park near the picnic tables and river bank. Ivan Bootham was born in England and emigrated to New Zealand as a teenager. His published work includes novellas, short stories, poetry, cartoons, music and art criticism. He has had plays, documentaries, and short stories broadcast on radio. In 1973 he was awarded a NZ Literary Fund Writing Bursary. Director of "Once were Warriors" in 1993, now has an established career overseas. Mervyn Kemp (WRC Chairman and councillor) lived 3.12.1912 - 24.1.2004. Mervyn Hall Kemp, CBE, MBE, FCA, JP, was Mayor of Tawa for 28 years, during the greater part of its existence as a borough. Murray Mexted (former All Black ; rugby commentator), born 5 September 1953 in Wellington. Murray attended Tawa College. He was first selected as an All Black in 1979. Susan Butterworth has been an independent public historian since 1985. She has written on a wide variety of topics including local and central government, business, community history, and some Maori issues. Susan is currently writing the fifth volume of the official history of the NZ Police. Built in 1862 by Nathaniel and Sarah Bartlett. At one stage the house was used as a clubhouse for the Ranui Golf Club, which operated a 146 ha. golf course there in the 1930s. The present Greer House was built in 1865 by Francis Greer, and was extended about 1908. The farm building south of the house may have originally been a flourmill, with loft, grain chute and a nearby millpond. A street map which also highlights public buildings such as churches and schools. A largely original example of a colonial house which was built for William Nott, a farmer, around 1860. Access to the property was originally across a bridge from the Old Porirua Road. I remember Tawa: a collection of memories / Barbara Adams.2002. Tawa Flat and the Old Porirua Road, 1840-1955 / Arthur Herbert Carman 1956. Tawa Flat and the Old Porirua Road, 1840-1970 / Arthur Herbert Carman 1982. Tawa: enterprise and endeavour / K.R. Cassells. 1988. The Streets of my City: Wellington, New Zealand. / Irvine-Smith, F.L. ; 1948. Oral histories recorded by Mervyn Kemp are available for download or listening online on the Mervyn Kemp Oral History page. Other histories are held at the Enquiries desk, Tawa Library. Linden School, established in 1952, 58 Ranui Terrace. Tawa College, established in 1951, 38a Duncan St. Newspaper clippings are held at the library enquiries desk in the top drawer of the filing cabinet. For more newspaper clippings, ask at the 2nd floor enquiry desk at the Central Library.